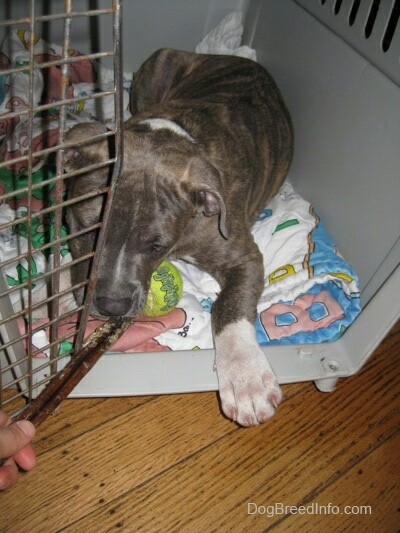 Raising a Puppy - Spencer the Blue Nose Brindle Pit Bull introducing a new crate. We were taking Spencer on a day-trip in an RV. Spence could ride outside the crate in his dog bed while we were on the road, however we didn't want to give him free roam while we were not in there with him. I brought out a crate Spence had never been in before. It's natural for a puppy to be cautious of new things and Spence didn't want to go inside this new boxy-looking thing that just appeared on the porch. 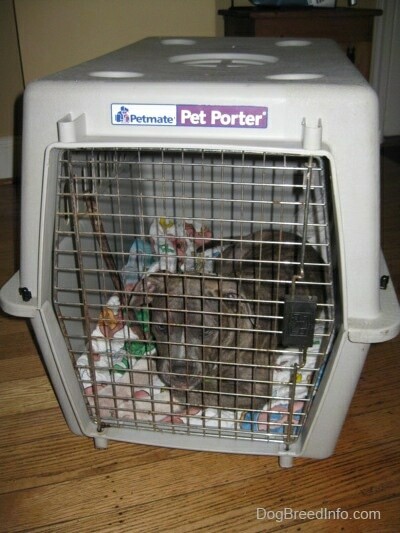 If I wanted him to actually like his crate I could not just put him in there and close the door. 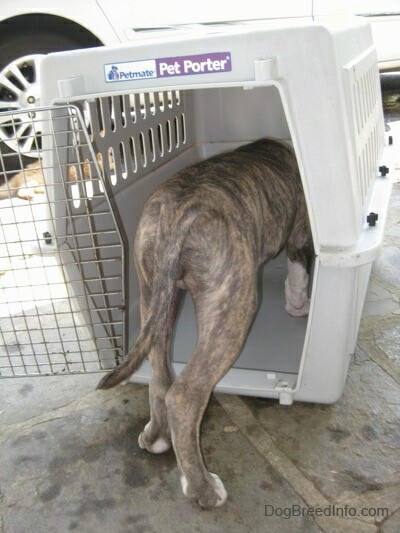 A dog needs to walk into the crate itself, not be put in there by a human. Closing the door on a dog that is unsure about where he is makes the dog even more unsure and feel trapped. This applies for not only crates but anything else you are putting a dog or puppy into, such as rooms or cars. You never want to close the door on a dog that is not relaxed. I used food to lure him into the crate. I place the food close at first so he could eat it without actually stepping into the crate. I slowly move it back further and further each time I tossed a new piece in. This time the food is far enough back that if he wants the food he has to put his paws in the crate. Oh boy, what's a puppy to do? 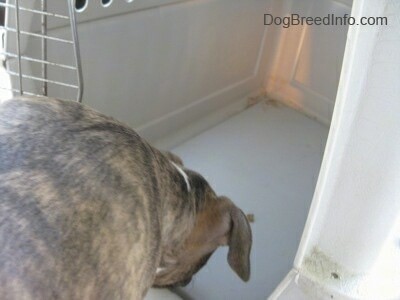 The smart pup decides to walk around the outside of the crate to check and see if there is any other way to get the food. And discovers that if he wants it, he has to go in and get it from the front. He's just not so sure so I toss a second closer piece to tempt him even more. Spencer decides to go for the closer piece and while he is in there he decides if he goes just a little further he can get the one near the back too. And then quickly comes back out again. I continue to toss food into his crate and he gets better and better at going in to get it, but he comes right back out again. When he starts to lose interest in the food I decide to switch to a tennis ball to keep his attention. I toss the ball into the crate and before Spence can even try and get the ball Sandy the cat runs in after it. Sandy steals his ball and hijacks his crate! Spencer's reaction to Sandy the cat stealing his ball. We give Spencer a short break from our crate work and come inside the house. Inside the house we do not have to worry about the cats. Time to play again. Amie tosses the ball into the crate and Spence goes in after it. Spencer decides to play with Bruno. We spent a good hour or more working with him before he was comfortable with the crate. We let him do it at his own pace. We cannot rush him or he may end up not liking it. I put a blanket into the crate and toss in his ball. Spence walks in and appears to be even more relaxed about it so I ask him to lie down. He does and I give him his bully stick to chew on. After he chews the stick for a bit I decide it is good and safe to close the door. 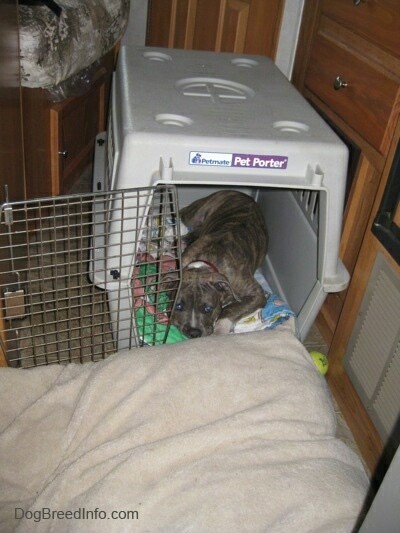 Later on the road trip we leave the crate door open and place a dog bed in front of it to keep the door from closing. Spencer decides to go into the crate on his own and lie down. Success! Spencer sees the crate as something positive. A lot of people just put their puppies into the crate and close the door while the puppy is still anxious or unsure. Doing this makes the puppy feel trapped in a place it is not so sure about. Never close a crate door until the pup is relaxed. Leave the door wide open. This includes pushing the door closed and leaving it unlatched. If you push the door shut and leave it unlatched and allow your puppy to nose the door open, you are teaching the puppy that if it paws, noses or bites at the door, it opens. This may cause issues in the future when your puppy decides it wants to get out of the crate. Spend the time and do not rush it. Introducing Spencer to this crate took about an hour. Some puppies may take longer and some shorter. Stay calm and keep the atmosphere on the quiet side. Your puppy or dog will be more likely to relax if there is not a lot of excitement going on around it. 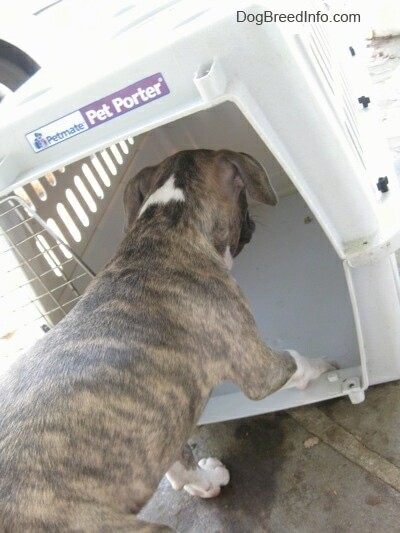 If you already have a dog or puppy that does not like being in its crate it is not too late. Start from the beginning as if he has never seen a crate before. It may take longer to associate the crate with positive things, however it is very possible to turn things around if you take the time and do it right.